Sean P. Sullivan - Washington Wine Report: Coming soon to a mailbox and newsstand near you! Coming soon to a mailbox and newsstand near you! 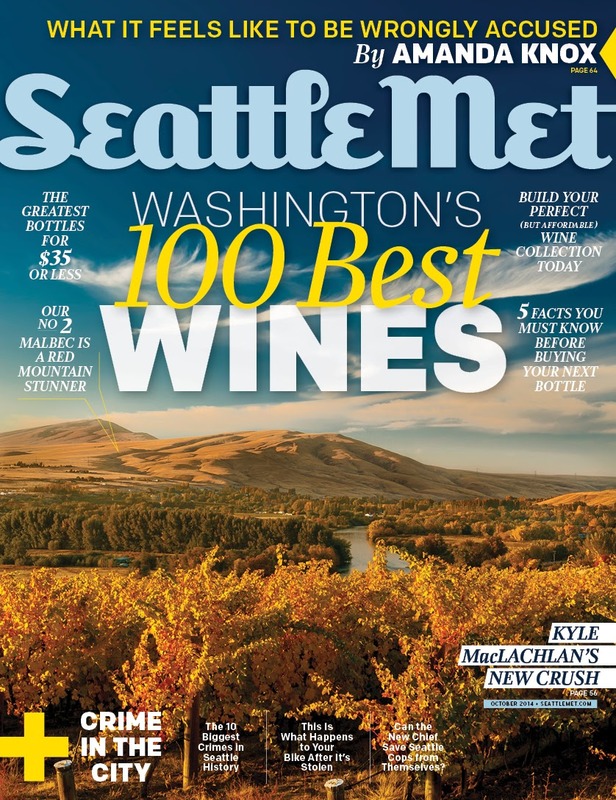 The October issue of Seattle Metropolitan magazine is coming out this week and contains this year’s Top 100 Washington wines list. This is the fifth year that I’ve had the pleasure to write this article for the magazine. In addition to these lists – which comprise the Top 100 - there are also lists for Top Wines $25 and Under and Top Wines $15 and Under available on-line. The issue also contains several subarticles, including an article about The Rocks and how I went about tasting the wines. Subscribers were sent the issue at the beginning of this week. It will be on Seattle area newsstands September 19th and available on-line at the beginning of October. I'm guessing you knew what winery you were tasting ahead of time. Do you think knowing the winery ahead of time before tasting influenced your rating and notes? Have you ever considered doing a blind tasting? Lucky7MQ, for the first three years I wrote this article, I did the tastings blind. However, it requires a significantly larger amount of time and effort to organize and execute. I also didn't see much impact on my ratings, blind or not. Talking with people afterwards, few realized that I had done the tastings blind even though it said so in the issue. So I was adding a lot of time without seeming to add much value. While I do believe blind tasting has a place (and I taste wines blind for Wine Enthusiast), there are also significant drawbacks to blind tasting in a setting such as this, where you are tasting a very large number of wines (60+) in a sitting. For example, tannin accumulation can be a significant problem. When tasting a wine that seems excessively tannic, you have to wonder, “Is it the wine that is excessively tannic or is it just accumulation?” When blind tasting the wine, all you have to go on is what’s in front of you. You have to assume the wine is excessively tannic and rate it accordingly. Alternately, you question your judgment, worry about tannin accumulation, and perhaps let that affect your rating. When I did the tastings blind, at times I would pull the bag and – having tasted the wine before – I would say, “Yes, that is an excessively tannic wine.” Alternately, I would say, “No, that is not an excessively tannic wine and my palate is suffering from accumulation.” However, at that point you have unblinded the wine so the only options are to use the score you have given – knowing that it is incorrect and has been affected by the wines in front of it – or use the second sample and retaste the wine at a later point hoping the same thing doesn’t happen again. Additionally, an advantage to non-blind tasting is that it allows for repeated sampling of the wines later that day as well as in subsequent days. This helps counteract any issues caused by order (such as the effects of an excessively sour or bitter wine) or tannin accumulation. It also allows you to get a sense of how the wine ages. To me, these are significant advantages that provide a greater degree of certainty, tasting a wine four or five times over multiple days rather than just a single time or two at one particular moment. This is almost impossible to do when tasting wines blind from a logistical standpoint. Bottom line, especially as a team of one, given the amount of time tasting blind adds and the potential issues it presents in a setting such as this, non-blind is the way I decided to do it this time around. Oh joy! Another year of "Sean's Favorite Wines and Winemakers". Let me guess, you have wines from Cayuse, Reynvaan, Quilceda Creek and Leonetti in your top wines, and then your other favorites are from Christophe Baron, Chris Gorman, Chris Peterson, Jon Meuret (Martinez), Kevin White, Charles Smith and Kit Singh. How far off am I? It's the same wines over and over again. Taste them blind or don't taste them at all! This list is just turning into your favorite wines from your favorite winemakers, which makes it very inexpensive advertising for them. Your biases showed so brightly in last year's list I'm 100% sure I'll just see the same thing again this year. This list might carry some merit if it were not done by one person and the evaluation was done blind. Hopefully Seattle Met Magazine will change the format in future years, or just discontinue it. There is the good list. All the wines listed here are so nice. I have tasted all. Cheers and have fun. The irony of an essentially anonymous commenter writing about blind tasting is not lost on me. If you stand behind what you write, publish your name - your full name - next to your criticism. I'm assuming this is the reason you left this message here as opposed to Seattle Metropolitan where it would seem to have a more fitting home - because you cannot do so anonymously there. Regarding these being my "favorite wines and wineries," I chuckle because some of my personal favorite wines are not on this year's list - they did not rate highly enough to be included, despite my affection for them. For the wines that are on the list, I would say compare my evaluation to scores from the major publications. It is not my “favorite wines and wineries." It is my list of highly rated wines based on my evaluation that I expect would have a high degree of concurrence with professional reviews elsewhere. These are top quality wines and it certainly is not just me that thinks so. I am always on the search for new wines and other wineries making high quality wines - part of the reason Seattle Metropolitan has an open submission process for this issue. Many do not. Regarding the list having more merit if it were not done by a single reviewer, what Seattle Metropolitan does in this regard is consistent with every major U.S. wine publication. If there were consensus to do otherwise, this would not be the case. Rather, there is a consensus to do it with a single reviewer as it is done here for well-covered reasons. If you disagree with the methodology, the wineries, and the wines; you don't feel that these are top quality wines; or you feel that there are other wines out there more worthy of attention – while I’m grateful for your readership - perhaps this isn't the issue or the site for you? Or perhaps write your own list? That's how I got started. Writing about Washington wines and wineries and putting my own reviews out there. Oh, and I put my name behind them too!